In this short post I am going to cover the workaround to a problem I’ve run into installing MODx Revolution (currently in Beta 5) on Wampserver. I am using the most current version of Wampserver at the time of this posting – 2.0i, with Apache 2.2.11, MySQL 5.1.36, and PHP 5.2.11. By default Wampserver 2.0 comes with PHP 5.3.0 but you can add on other versions of Apache, MySQL and PHP and switch between them as needed. I’ve been running Wampserver with the 5.2.11 version of PHP because I’m working on some old projects that haven’t quite caught up with 5.3 yet and throw a lot of errors when I try to run them in 5.3. When I start the install, it works fine until the point where the Installation Summary shows up and I get an error regarding the MySQL client version. Checking MySQL client version: Failed! I can’t continue with the install at this point because of this error. 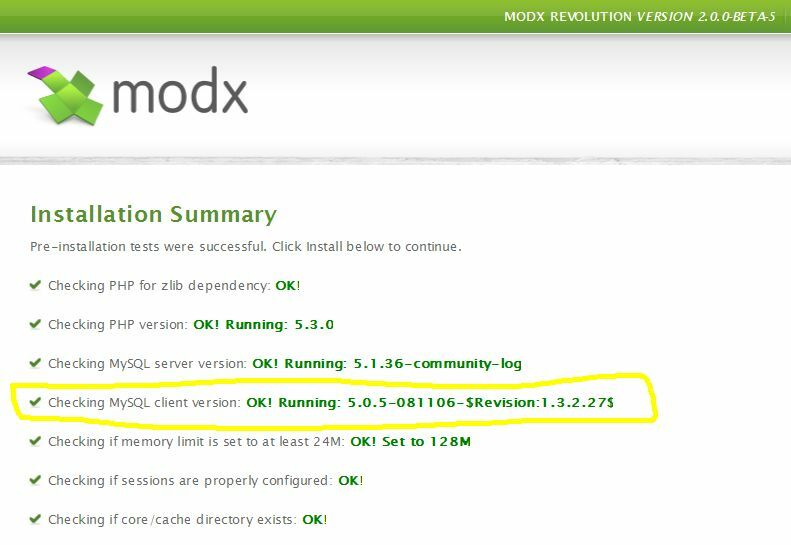 MODx Revolution will not work with MySQL client version 5.0.51 and 5.0.51a because of “serious bugs with PDO”. You can read more about this in the MODx docs. One solution that I tried was to install MySQL 5.1.41 but that didn’t resolve the issue. What seemed to finally work was to run Wampserver in its default state with PHP 5.3.0 selected. Suddenly, the install went through successfully, no problems. If you’re like me and you’re running a version of Wampserver with PHP 5.2.x and are having these issues, go to http://www.wampserver.com/en/addons_php.php and download PHP 5.3.x and install it, this should resolve the Revolution installation issue. 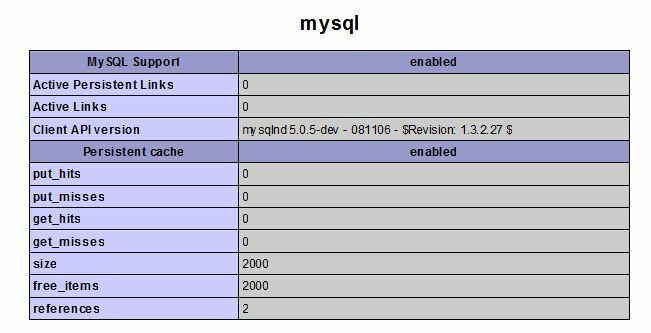 I’m not 100% certain of the relationship between the server and client versions of MySQL or how the version of PHP plays into the whole equation, so if anyone can enlighten me on this by leaving a comment that would be great 🙂 This may just be an issue of version matching with the way Wampserver builds its stack. In any case, I hope this helps someone out there who’s been wanting to mess with Revo and been having issues with Wampserver. 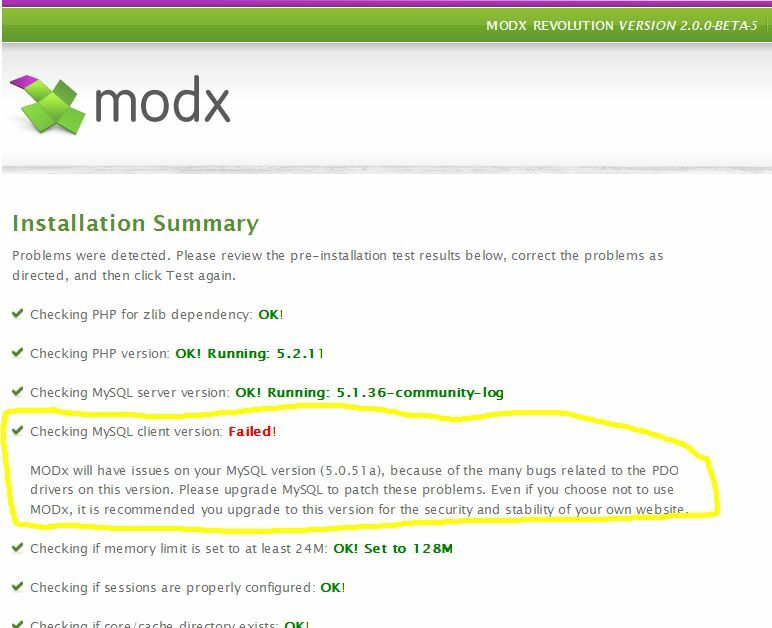 My first attempt at modx – am attempting to install modx revolution. Followed your beginner screencasts and setup wampserver 2.01, modx database with privileges etc. Add /setup to the end of your url. This should take you to the Revo installation screen. Also make sure you’re running PHP 5.3.0 in Wampserver otherwise you’ll run into errors. Thanks…meanwhile i had gone thru the “Exploring MODx Revolutions” screencast and figured that out – of course kicked myself for not having spent enough time on your wonderful casts before shooting of an SOS. sorry. and thanks. No worries, and you’re welcome! 🙂 Glad you were able to figure it out. I am als0 trying to run modx revo on a windows pc and have the same 5.0.51/5.0.51a isssue as you did — but im installing to IIS instead of apache/wamp. 1. Regarding the 5.0.51 issue, it doesn’t matter what version of mysql or the mysql client you have installed or upgraded to on your machine. What actually matters, and shows up on your ‘phpinfo’ page, is what version of the mysql client the php engineers choose to build into each release of php. For example, for php release of 5.2.12, they chose to include a 3 year old mysql client version of 5.0.51a into the php build. That’s the broken one in regards to pdo usage. 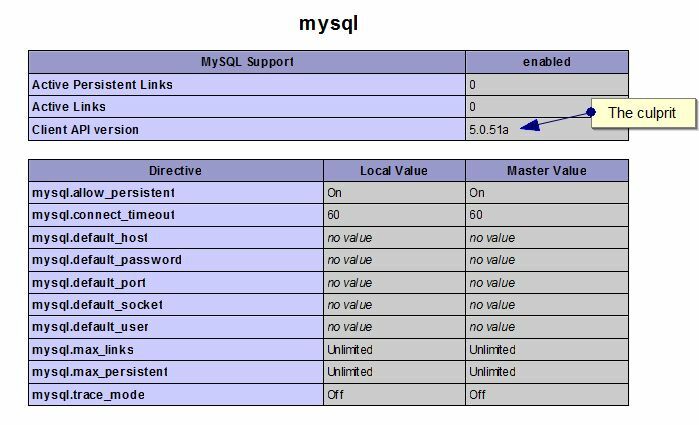 2. mysql has released MANY updated versions of the mysql client since 5.0.51– all the way up to 5.1.45 currently for windows. (as of my posting date) So it’s not like better versions of the mysql client aren’t available to build into php, it’s just that the enginerrs have chosen to use an old one which has lots of issues. 4. Instead of upgrading to php 5.3.x you could also downgrade to 5.2.6. That has a mysql client of 5.0.37, if I remember correctly, and both of those will work with modx revo. Thanks for your take on this and for the useful information. One of the reasons I like Wampserver is that I can have different versions of PHP running and can switch between them. I do wish they would match the MySQL client and server versions better.